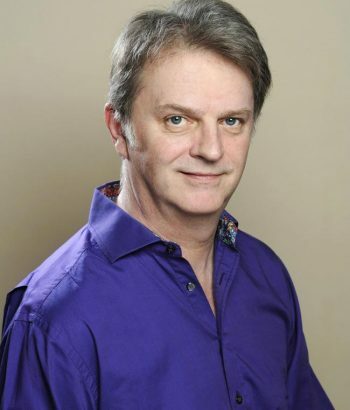 Paul Merton has been at the forefront of the UK improvisation scene across four decades. 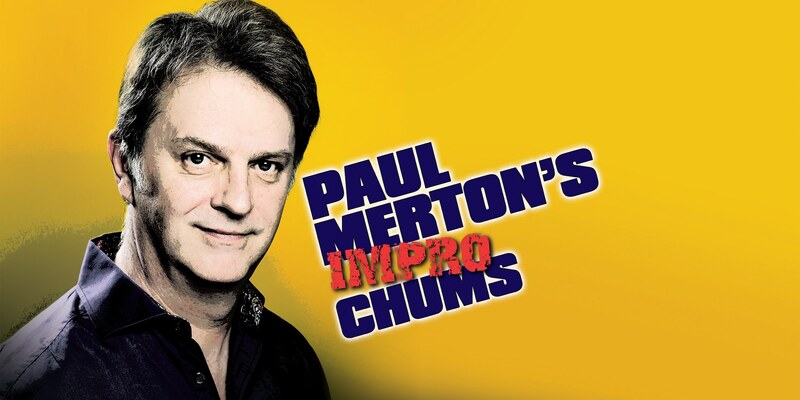 Having appeared in the first ever episode of Whose Line is it Anyway on Channel 4 in 1988, and as a founder member of the legendary Comedy Store Players, he went on to create Paul Merton’s Impro Chums, who have starred at several Edinburgh Fringes and taken their adlibbing ways on tour across Britain to great acclaim. The longstanding line-up of Paul, Mike McShane, Suki Webster, Richard Vranch and Lee Simpson, has been added to in the shape of keyboard player Kirsty Newton. As the group prepares for its latest national tour, they discuss the explosion of new improvisation acts, the pleasures of getting around the country on a luxury bus, and whether any preparation is possible for an improvised show. What would you say are the main differences between putting together a written show and performing a show that’s entirely improvised? Paul: The difference between this and a written show is that the latter takes a lot of pre-thought and hard work, and if you’ve got a bit that doesn’t work, you think “how am I going to fix that?” With impro, there are no bits to worry about because they don’t exist yet. Suki: There’s a joy in both, but this is like being on tour with your best friends and playing like six-year-olds, and it’s fabulously good fun. The joy of a script is that whether you’re acting you get to hone and perfect a performance and with writing it’s the same thing; in impro there are always going to be little mistakes, that’s part of it. Paul: In written pieces, if there’s a very funny line that always gets a big laugh you’ve got to try and get that same laugh every night while making it sound like you’ve never said it before, so there are different sets of challenges. Mike: When you get an established script and you work on it to make it seem like there’s a real human exchange in real time, whereas impro is a real human exchange in real time. Once you’ve established the characters, the content is developing as you go. 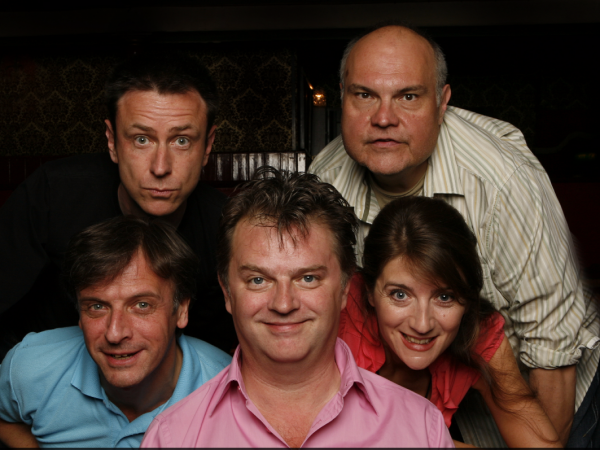 Do you watch any of the other impro groups that have cropped up in recent times? Suki: I don’t watch masses but I do guest with lots: I love being invited to guest with all sorts of groups, it’s great fun. It’s good to work with other people and get new ideas. I think there was an increase initially because of the success of Whose Line…? and now with the success of Showstoppers and Austentatious, so other people think that this might be a path in. Richard: Also it’s not just performers who do it. People who have day jobs and business people do it as a hobby or as therapy or perhaps for team building, so it’s spread outside the community of people who do this for a living. Mike: Those sophisticated examples such as Showstoppers and Austentatious found success in the form of narrative improv instead of game improv like Whose Line…? and us, and that brings a more sophisticated audience and demands to keep it interesting. It keeps growing and getting better and having more history behind it, which can only keep inspiring people. Is there any kind of preparation you can do before you go onstage? Paul: For me, the preparation is having done it for 30 years. Suki: We will do a one minute warm-up of Whoops, the first game of every Chums show, where somebody is pointed at and has to pick up the sentence. Paul: That loosens you a bit and it reminds us when we’re playing a larger venue to not talk so quickly at first. Don’t be slow but be clear. Be pacy but not too quick. Richard: Having done it so many times before with the same team, that trust in each other is solid and unshakeable and we’re confident in each other. People say that working together as a team makes it easier because you know what the other one is going to say. But in fact it’s the opposite: it makes it easier because we trust not to have to know what the other one is going to say. It’s not that we’ve got a code, it’s that we can wing it because of experience and trust. Do you ever analyse what’s happened during an Impro Chums show or is it a case of once it’s done, you just forget about it? Mike: We have a little post-mortem to talk about how something might have been more effective, but that’s about it. Paul: The danger with doing the same games every time is that you can fall into a pattern about how you play them and you want to avoid that as much as possible. On tour, we mix up which games we do and who’s doing which games. Richard: People come up to you afterwards and say “oh, we’d loved the bit with the so and so” and I have no idea what they mean. Paul: Because it’s not something you have to remember, then you just don’t. You don’t even send a conscious command of “brain-wipe-delete”. It all just goes. What are the pros and cons of touring? Lee: I live outside London so I often travel separately, but Paul treats us to a big old rock and roll tour bus with beds, TV, a kitchen, on-board loo. It’s an indulgence but it’s absolutely wonderful; there’s a real camaraderie and fun to be had. We all do different things. Some go to the back of the bus and watch DVDs. Paul: Having a bus means that we can get back to London and go to sleep in your own bed, so that saves on hotel bills. When you’re doing all these dates, you want to cut down on stress as much as possible, such as constantly waking up in hotel rooms and wondering what city you’re in and missing home. So if you can get home, even if it’s 2 or 3 in the morning, it’s still more preferable to hotel rooms. Richard: And comfortable transport means we arrive at the gig in very good condition and that makes a huge difference. Panicking because a train has been cancelled and worrying whether we can get to the gig in time is not a good way to prepare yourself for a show where you’ve got to be creative. What are the particular musical challenges to the show? Richard: In a verbal scene, someone says something and another person has to come back with something else and the exact same exchange is happening between music and singing. The co-operation is more evident because they’re in the same rhythm and pitch but it’s the same thing. Kirsty: It’s really important that you’ve been listening. Sometimes I’ve been enjoying a scene so much, and I have to remember that I’m not just here to watch. Paul: The audience love the musical bits and when Mike and Suki are singing in film and theatre styles and there’s a musical number or Gilbert & Sullivan, the audience love it. It’s a real crowd-pleasing element. Paul: To be able to play music is an ability and a gift that a lot of people don’t have and they admire it even more than just the verbal stuff: the lyrics and the tune just happen and it sounds like the showstopper of the year! 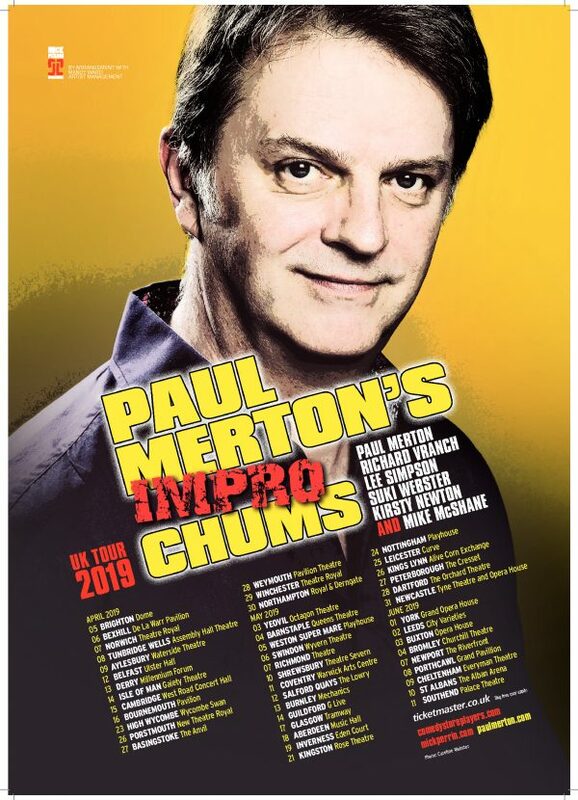 You can see Paul Meron’s Impro Chum at The Assembly Hall, Tunbridge Wells on 8th April and see online for further dates.